With the BK-100 Lock ‘N Load Wheel Chock™ mounted, you simply drive or push the front tire into the self locking chock and step off. The bike is held secure. The tie downs are placed between the front fender and tire, eliminating the need to compress the front shocks, and cause damage to the seals. This alone could save you hundreds in repairs. Loading made easy with Lock 'n Load Wheel Chocks Convenient one person loading, no help is required. The BK-100 is a complete all-in-one wheel chock system that provides secure transportion for all sizes and styles of road motorcycles. 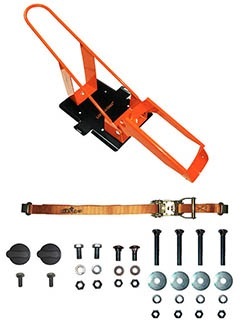 Our unique tie-down feature allows you to elimate the hassle of using multiple tie-downs and creates a loading procedure that can be accomplished by any one man or woman. Save your suspension with the BK100-2 Front Tire Tie-Down, that eliminates the need for compressing front forks to acheive transport readiness. Lock ‘N Load strives to be the easiest system to use and install while providing a solid steel construction that can withstand the heaviest abuse. The BK500 is an all-in-one transportation system for all Dirt, Dual-Sport, and Enduro Motorcycles 100cc+. Designed to fit your front tire like a glove, this system allows your bike to stand alone with no straps. Upgrade this system to it’s highest potential with the BK102 Bike Stand and you will be able to quickly interchange from trailer to track for the most stable and functional bike stand on the market. No more lifting and bike falls, no oil change mess, less cargo, more wheelies. 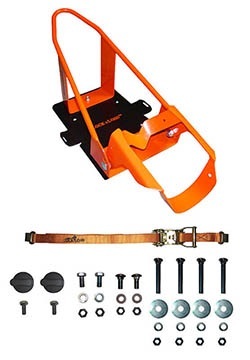 The BK1000 is our All-in-One transportation kit that consists of the BK100 Wheel Chock and the BK202 Ratchet Strap System. This kit provides the most secure transport system on the road with the fastest load time in the market. The BK202 is hands down the most functional tie-down system available. 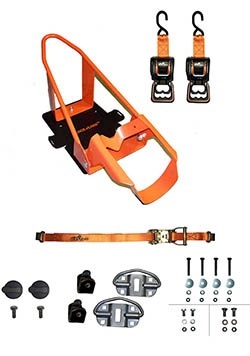 Consisting of our new heavy duty, two-inch quick retracting ratchet straps, and patent pending Quick-Release anchor system, this kit provides utility that is unmatched by the competition. When transporting, simply lift handle open to extend and attach s-hooks, and with a few quick ratchets your bike will be fully secured. 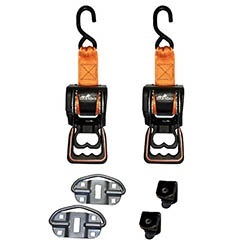 When not in use, the Quick-Release Strap Clips allow you to easily remove the straps with no tools, so your cargo area is clear of any obstructions. Safe Work Load: 1166 lbs.